The much awaited ‘Microsoft Windows 8’ – Windows reimagined was globally launched yesterday. However, the RTM version of Windows 8 was made available back in mid August to the MSDN and TechNet subscribers. Perhaps, if you’re already running the final Windows 8 RTM without activation then a watermark, activation prompts and some disabled personalization features might be spoiling the taste of the new OS. You can overcome these limitations by activating your Windows 8 copy now! Apparently, Windows 8 doesn’t requires an activation key during installation and you just need to enter a valid installation key to continue with the install process. This certainly doesn’t activates your Windows 8 OS as you need to input a genuine license key in order to activate your copy. Surprisingly, after a while we noticed that there was no option to enter or change the product key, hence no feasible way to activate the OS. This probably happens if you installed Windows 8 from a volume license media. Well, if you’re getting the above error then you can’t enter a product key as there is no option for that. Fortunately, there is an easy solution. Now go to Activate Windows from Metro UI PC Settings and enter the key. Make sure you’re connected to Internet while activating. Open Command Prompt (Run as Administrator) and enter the below command. Now you can activate your Windows either from Control Panel Activation wizard or Modern UI. 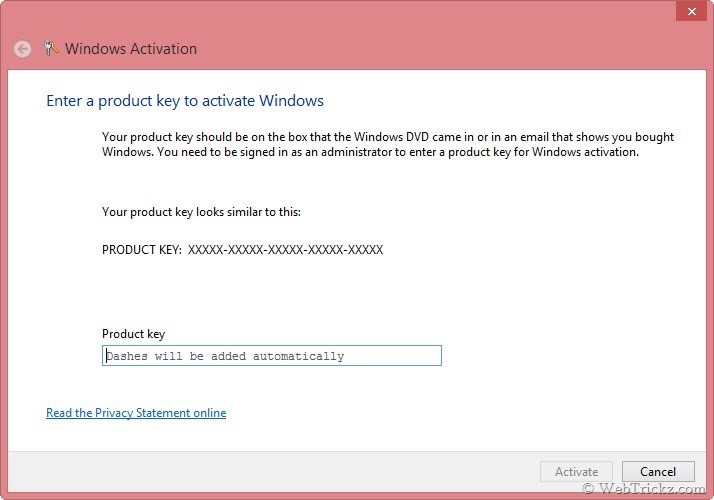 Windows Activation dialog will open up, enter a product key to activate Windows.